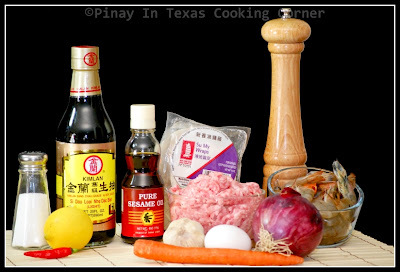 One of the greatest influences on Filipino Cuisine came from the Chinese who colonized the Philippines between 1200 and 1300. Not only did they introduced noodles to us, it was also from them that we got egg rolls and dumplings that were adapted to our cuisine using our local ingredients. I grew up loving the pancit (different kinds of them) as well as the egg rolls that my parents used to cook, but I never had dumplings except for store-bought siopao until I was in college. Back when I was a little girl, you can't find other dumplings aside from siopao in the 2 Chinese restaurants in our town, neither were dumpling wrappers available in our town's supermarket! Too bad because my parents weren't patient to make dumpling wrappers from scratch. It was in college when I had my first taste of Siomai which was a hit during that time. It was and still is one of the most favorite street food in Metro Manila and other major cities in the Philippines. 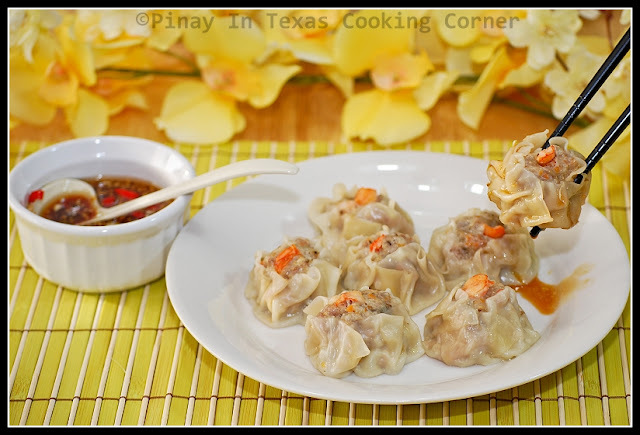 Siomai, also known as Shumai, Shaomai, Siomay, Shuumai in other Southeast Asian countries, is a traditional Chinese pork dumpling. In the Philippines, it can either be beef or pork. Hen Lin's siomai was the best for me back then! I fell in love with it, and it became my favorite snack and a constant companion during late night review for exams. 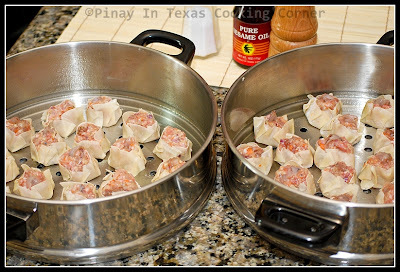 I loved it so much that in no time, I started cooking siomai. It was good that siomai wrappers were available in Metro Manila supermarkets and soon enough, it became available in provincial supermarkets too! So whenever I was in the province, I cook this for my parents, and it became one of our all-occasion favorite! I've been cooking this for over 20 years now, and I may say that I keep loving it more and more. It has become Clarise and Cherlin's favorite too...and we always can't get enough of it! 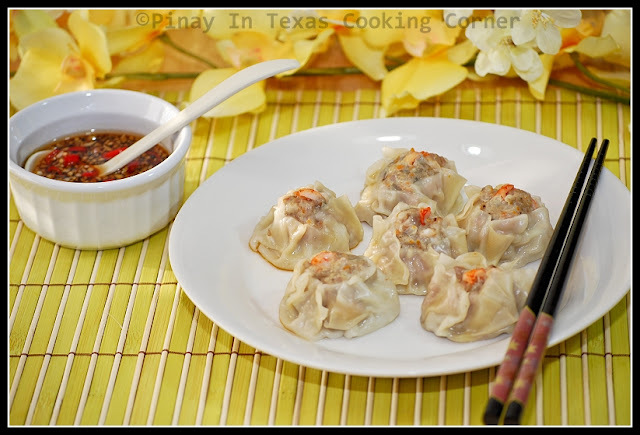 Today, I want to share with you my siomai recipe. 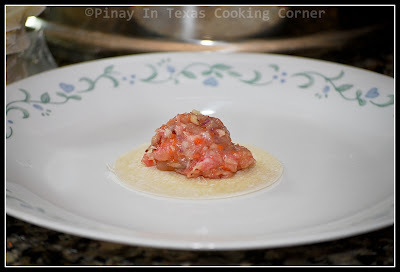 I don't use too much extenders in it so as not to overpower the flavor of pork and shrimps. I hope you'll like it! 1. 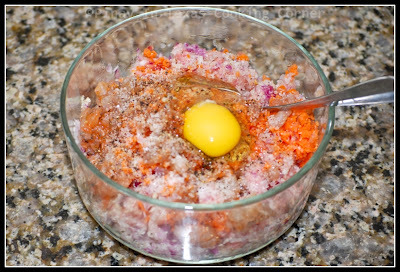 In a bowl, mix all the ingredients well (except for the wrapper of course!). 2. 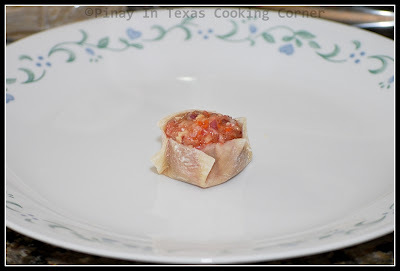 Get one siomai wrapper and put about 1 Tbsp filling in the center. Gather up the edges of the wrapper. Press lightly as you pleat each side. Repeat procedure to wrap all the fillings. 3. Steam for 25-30 minutes. 4. Meanwhile, prepare the sauce. 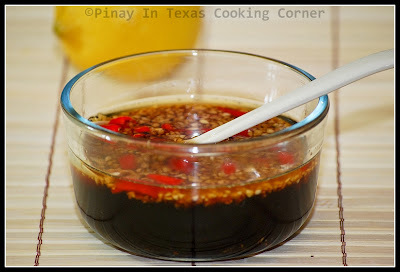 In a bowl, mix soy sauce, lemon juice, sesame oil and sugar until sugar is dissolved. Add Thai Chili and garlic. 5. 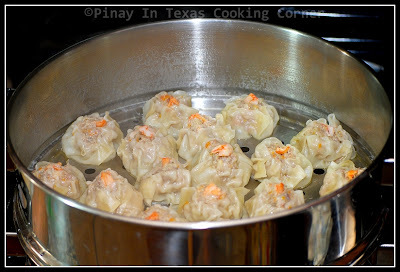 Remove siomai from steamer. Serve hot with sauce either as appetizer or snack. one of the favs too at Malaysia Tina although I only have it at stalls and restaurants. No cooking pork at home since my hubby is pork free. Its very popular as one of those serve as Dim Sum. dumplings and shumai have to be one of my fav foods! these look great!! 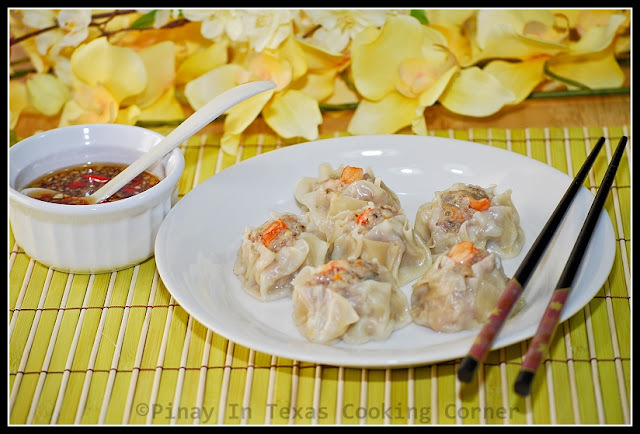 I love shumai but I have never tried to make it at home! I was supposed to go to dim sum a week or so ago but it got canceled. Your pics make me want to reschedule!!! Your siomai looks great.We love to have this ,when we'r in dimsum restaurant. your dumplings are neatly packed and folded... love it. I keep a stock of siomai in my freezer, it comes handy every single time.. when making soups or for the kids to munch on. I love sio mai too, Tina. Dumplings are just addictive. I like the way you made it here, especially with that spicy dipping sauce. I love the way you are making them.. looks so tasty! I could eat all of them:)) Fantastic recipe Tina!!! This is one dish I wish I could cook... laging fail kasi. :) I will try this recipe. wow, this is my hubby's fave! These are my daughter's favorites, look delish. I wish i was your neighbor. You make all my fav dishes. Pork dumplings are my fav and I can never fold it like the way you did .. so neat! Mmm! My mom makes these every couple of months and I'm always chowing down on them :-) They're just soooooo tasty! Thank you for sharing your homecooked dishes and desserts. Hi Ate Tina:) Can I make the siomai ahead of time and just steam it the next day? Yes you can. I usually put them on a plate and then cover the plate with plastic wrap before putting in the ref. Thank you for showing so clearly how to wrap them before steaming. Great recipe! can i add potatoes as an extender? ***Yes, you may store cooked/uncooked dumplings in the freezer. I usually put them on a plate then cover it with plastic wrap and flash freeze them for about 2 hrs. Once frozen, I transfer the siomai into a ziplock and store them in the freezer for up to 3 weeks. Just be sure to seal them tightly so they won't get freezer burns. When ready to eat, steam frozen cooked siomai for 10 minutes or until hot, and uncooked siomai for 35 minutes. Remember not to thaw them before steaming because that will definitely make the siomai wrapper stick together. ***I have never tried using potatoes as extender for siomai, but I guess it will work. Maybe a half cup of potatoes will be a good amount.